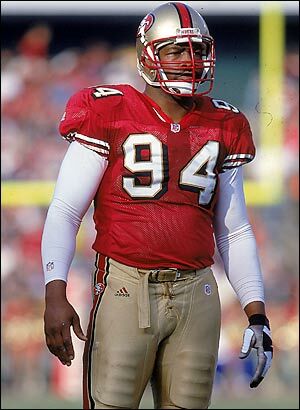 The greatest athlete to wear #94- former San Francisco 49ers and Dallas Cowboy defensive end Charles Haley.Haley is the only player to play for 5ive Super Bowl winners. During his 12 year career he had 100.5 sacks and was twice named NFC Defensive Player of the Year. He was a 5ive time All-Pro. He should probably be in the Pro Football Hall of Fame but it is believed that his strange behavior during his career is a reason he hasn’t been yet. Other notable #94’s- football players Chad Brown, Dana Stubblefield, Sean Gilbert, John Abraham and Keith Traylor but clearly Haley is the greatest to wear #94.